OSWEGO, NY – A church full of parishioners, two area bishops, and stirring musical performances were all part of the celebration at Episcopal Church of the Resurrection, Oswego, on November 21, as Reverend Anne Wichelns was installed as assistant priest for the Episcopal-Lutheran Faith Partnership of Oswego and Fulton. The Faith Partnership of the Episcopal Church of the Resurrection and Grace Evangelical Lutheran Church in Oswego, and Prince of Peace Evangelical Lutheran Church in Fulton welcomed Rev. Anne Wichelns as the partnership’s assistant priest. Rev. Wichelns’ new ministry was celebrated with a special mass held at the Episcopal Church of the Resurrection in Oswego. 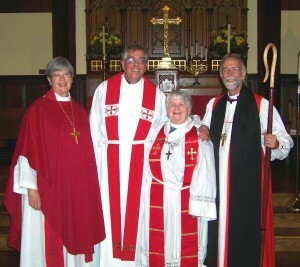 From left are: Bishop Marie C. Jerge of the Upstate New York Synod of the Evangelical Lutheran Church; Rev. Richard Klafehn, Pastor of the Episcopal Church of the Resurrection, Grace Evangelical Lutheran Church in Oswego, and Prince of Peace Evangelical Lutheran Church in Fulton; Assistant Priest, Rev. Anne Wichelns; and Bishop Gladstone ‘Skip’ Adams III of the Episcopal Diocese of Central New York. Rev. Wichelns, who prior to joining the ministry, worked as an English teacher in the Indian River High School and a facilitator for a school based drug abuse prevention program, is a welcome addition to a faith partnership that includes Grace Evangelical Lutheran Church in Oswego, Prince of Peace Evangelical Lutheran Church in Fulton. The installation of Rev. Wichelns is an integral part of a faith partnership that began in the spring of 2011. In September of that year, Pastor Richard Klafehn was named lead pastor for all three churches. The addition of Rev. Wichelns provides the faith partnership with a full complement of clergy that will help the faith partnership focus on its ministry and achieving it mission of worshiping and working together. It was a goal that Bishop Marie C. Jerge of the Upstate New York Synod of the Evangelical Lutheran Church was happy to achieve. “When our faith partnership began our intention was to ensure that we were fully staffed. Pastor Klafehn and Rev. Wichelns will share services and pastoral care and make the availability of clergy much easier,” said Bishop Jerge. 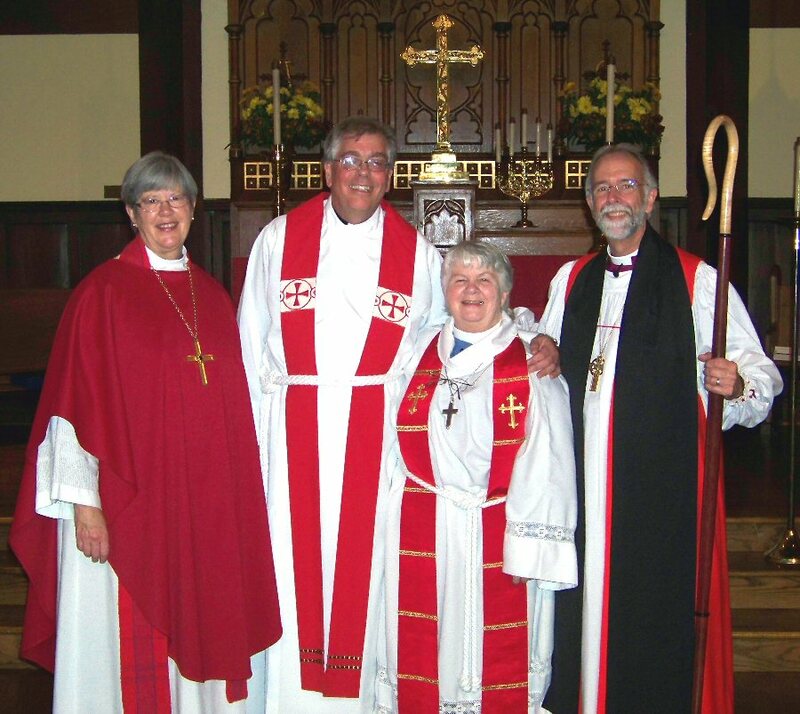 While the faith partnership between the Episcopal Church of the Resurrection Church in Oswego, Grace Evangelical Lutheran Church in Oswego and Prince of Peace Evangelical Lutheran Church in Fulton is the first of its kind in Central New York, Bishop Jerge said that there are other faith partnerships within her Synod. “Our faith partnerships in Oswego and Fulton as well as other communities are doing very well. We are all working together and it is a very enjoyable and rewarding experience,” added Bishop Jerge. Bishop Gladstone ‘Skip’ Adams III of the Episcopal Diocese of Central New York echoed those thoughts. “We are very hopeful for our faith partnership as its goal is to strengthen our parishes and encourage our parishioners to be the presence of Christ in this part of God’s world,” said Bishop Adams. Rev. Wichelns, who also shares her time with St. Andrew’s Shared Presbyterian/Episcopal Ministry in Evans Mills, is excited about joining the ministry of the three parishes and putting her experience in faith partnerships to work. “As we move forward our challenge is how we live together as a community. Why do we gather and what is the benefit of sharing our faith? By sharing our resources and our talents we have full ministry in all churches and we can grow together. This is an exciting time. Many mainline churches are not tied to our culture as they were years ago; however this is a new day for the church. The digital age is having a profound effect,” said Rev. Wichelns. One of Rev. Wichelns’ duties will be to focus on youth and their families. “The cultural shift that has taken place over the past few years has lessened the role that the church plays in many people’s lives. Work schedules and children’s activities can make it difficult for young families to be actively involved with their church. I will be reaching out to parishioners of all three churches and discovering ways in which we can better accommodate them and make it possible for them to become more involved with their church,” said Wichelns. Since the faith partnership began it has proven to be a benefit to all three churches. Not only do the churches share resources they also share the wisdom and talents of each of the churches parishioners and leaders. The establishment of the Mutual Ministry team, comprised of representatives from each church’s governing bodies, ensures that the three churches are working together to achieve the goals. “Our Mutual Ministry team develops areas in which we can work together and studies ways in which we may share the good news that God is alive and good things are happening. We realize that we are more alike than different and that we can accomplish much more working in unison than could on our own,” said Pastor Klafehn. While the churches are in communion with each other, each has retained its own unique outreach to the communities they serve. The Church of the Resurrection hosts a prayer and care pantry that provides those in need with paper products and other items that may not be purchased with SNAP benefits and hosts a Mission of Miracles program that provides medical supplies and more to those in need in El Salvador and Honduras. Prince of Peace is heavily involved with the CROP Walk and Cherish the Children, a nationwide prayer and education initiative against child abuse, and Grace Lutheran has an active ministry for college students and they regularly support human concerns and Safe House for abused women. One initiative that the churches had worked together on is the Blessings in a Backpack program that provides food subsidy to 100 children each weekend. “Many families whose children receive reduced or free lunches in school may need assistance with meals on the weekends. Our Blessings in a Backpack program provide 50 children in Oswego and 50 children in Fulton with additional food so that they may enjoy healthy meals over the weekend. The Blessings in a Back Pack program is another way in which we reach out to the youth of our community to help them reach their true potential,” said Pastor Klafehn. According to Rev. Wichelns the faith partnership is on the right path to serving both the parishioners of all three churches and the communities that they serve. “This is truly an exciting time for all of us as we strive to live as disciples of Jesus seven days a week and God’s work together,” added Wichelns. Weekend services celebrated through the faith formation are: 9 a.m. at Grace Evangelical Lutheran Church, 201 E. Sixth St. in Oswego; 10 a.m. at Prince of Peace Evangelical Lutheran Church, 64 Gillespie Road in Fulton; and 10:30 a.m. at the Church of the Resurrection Episcopal Church, 120 W. Fifth St. in Oswego. Christmas Eve services will be held at 5 p.m. at Prince of Peace Evangelical Lutheran Church; 7 p.m. at Grace Evangelical Lutheran Church; and 10:45 p.m. at the Church of the Resurrection Episcopal Church.